The shirt dress. It's a classic that I believe every woman should have in her closet. Dress it up with pumps for the office, pair it with trainers for a casual and cute weekend outfit, or pair it with over the knee boots for a fun, yet slightly edgy look. Whichever way you wear it, it's a item that you'll keep reaching in your closet for years to come. I promise. The feature blogger of the week is Yana from A Handful of Stories. Is she not a total goddess in this red dress? Make sure to stop by her blog and say hello! This striped shirt dress is adorable with those OTK boots! They're almost like leggings, I really need to find myself some OTK boots this fall... that fringe coat looks great with the dress! Can't beat an extra layer of warmth, it starting to get chilly! Shirt dresses are great, and you look fabulous in yours! I love that you paired it with OTK boots - great look. The coat looks great with the dress, too. So cute! Love a shirtdress!! I love a good shirtdress and your striped one is so cute! Love it styled with the OTK boots! Thank you for the linkup! This shirt dress is perfect and screams versatile, not to mention the perfect weekend look. Hope you have a good one (weekend). That is such a great dress. Classic piece! I can totally see it with sneakers like you mentioned too. Have a good weekend! fabulous outfit! Love your boots. Yana is so gorgeous! Love that picture of her! I love the dress with the scarf and OTK boots! Great look! I love a good shirt dress and the tie at the waist just makes it all the better! Great look! Such a great striped shirt dress. Classic and cool. Love it styled with your OTK boots. Beautiful look! Love a good shirt dress, they're so versatile and perfect for the season! Loving this dress! I love a good shirt dress for the fall time!! Oooohhh love this! I agree a shirt dress is such a classic staple! I totally love it with the OTK boots! Love me a good striped shirtdress, and yours is the perfect version, Rachael!! So versatile and easily adapted to season after season after season. If you haven't yet, do come over and join in my Friday Link-Up? I'd love to see you there. 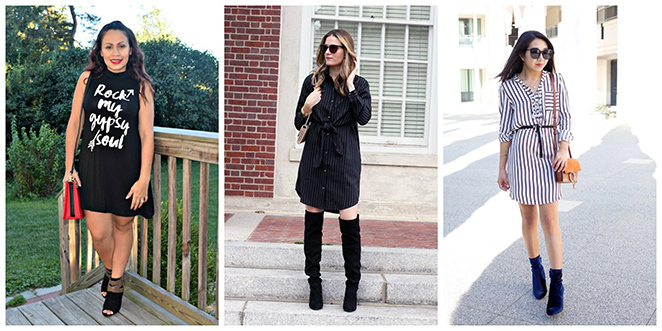 Love that chic shirt dress and how you styled it with the SM boots! Love the fun and slightly edgy look you've put together today, especially the touch of fall by pairing it up with the poncho blanket. You never disappoint. Very nice! I like it how you combined it with the plaid cardigan. Love this outfit! 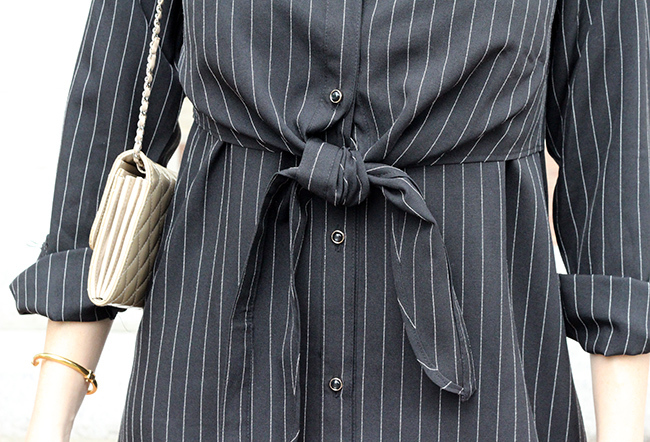 Two classics in one outfit: stripes + shirt dress! That shirtdress and boots combo is so great! Love! love the OTK boots. such a good combo with the dress!